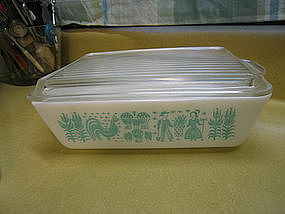 Marked as Pyrex Ovenware 1 1/2 quart refrigerator dish with lid. There are no chips, cracks, breaks or rough rims. I have 2 of this size available, as well as the 1 1/2 cup size and mixing bowls. I need your zip code to calculate the postage.